Who said you can only make risotto with Arborio? 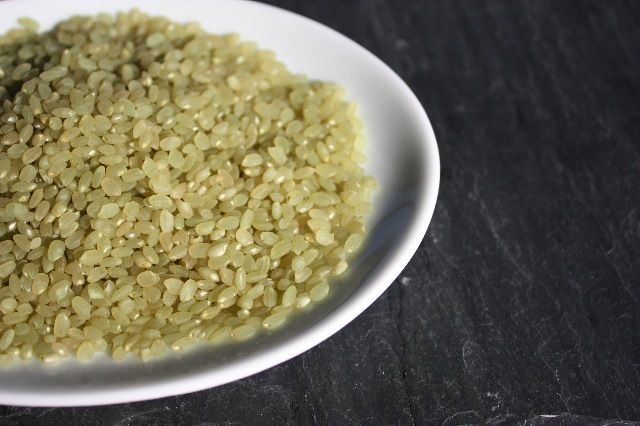 I found this beautiful short green rice, infused with bamboo juice. It’s sold in bulk at the Rainbow and looked so appetizing. I never cooked it before and wanted to try to make a new kind of risotto, with an Asian flair. There is no parmiggiano cheese in it, I didn’t think the flavors would fuse very well, besides, I don’t like cheese mixed with fish. They both have strong distinct flavors and when combined you tend to denature them. To add vegetables to this dish, I added butternut squash which added extra color and sweet flavor. For the fish, I had some coarse salt left in the kitchen pantry for a long time, and thought it would be perfect to use it to make a salt crust for the fish to marinate. The salt curst enables the fish to cook slowly and infuse in its natural flavors and as a result you get a delicious moist and flavorful fish. As for the cilantro jus, you can make it with many different herbs, such as parsley, tarragon, etc…the herb is infused in a brothy sauce and perfumed delicately any white meat or fish dish. First marinate the fish in the salt, sugar mixture for 1h30 and refrigerate. Remove the salt and rince well under water, if not rinced well, it will get very salty and therefore you won’t be able to eat it. Add a good quantity of ground pepper on the outside. For the risotto, proceed like a regular risotto, brown shallot in olive oil, add ginger, and stir fro a few minutes. Add bamboo rice, stir and coat rice with olive oil and shallot/ginger for two minutes or so. Add sake, and keep stiring until the liquid is absorbed, then add progressively chicken broth. Peel butternuet squash, cut in square pieces, sprinkle with salt and pepper, a drizzle with some olive oil, place under broiler until tender but grilled on the outside. Add butternut squash to the rice, add chives. For the cilantro jus, remove stems from cilantro and place leaves in boiling water for about 5 seconds. Drain and pat dry. Bring the broth to a boil, then put in a blender with cilantro leaves. Mix for about 15 seconds. Filter the juice and at the end, add lemon juice and olive oil. Sautee halibut in a pan with olive oil for about 4 minutes each side. 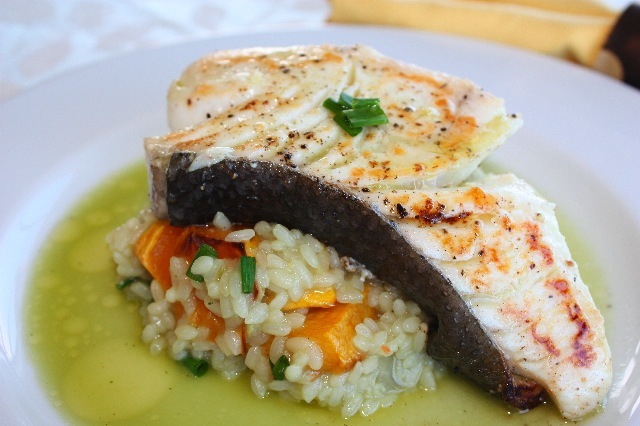 Serve with risotto in the middle, place halibut on top, and add the cilantro jus on top of halibut and around rice. This entry was posted by silvia on March 20, 2009 at 1:50 pm, and is filed under Fish/Seafood. Follow any responses to this post through RSS 2.0.You can leave a response or trackback from your own site.